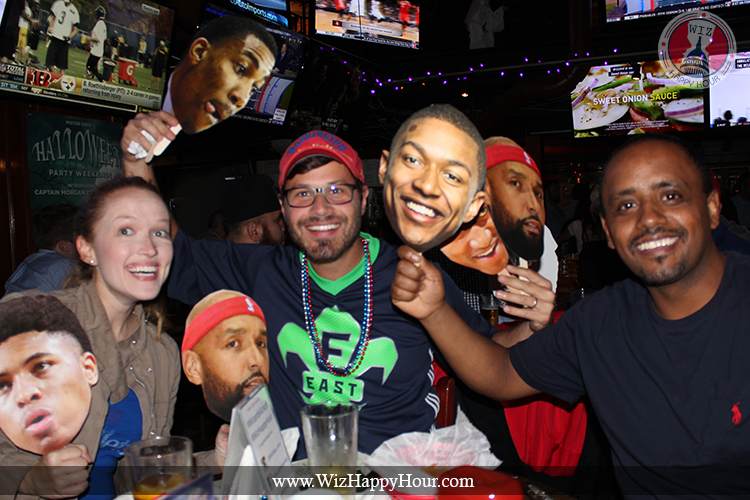 Washington Wizards Fan Happy Hour: The Return Of Wiz Happy Hour & A Wizards Victory! 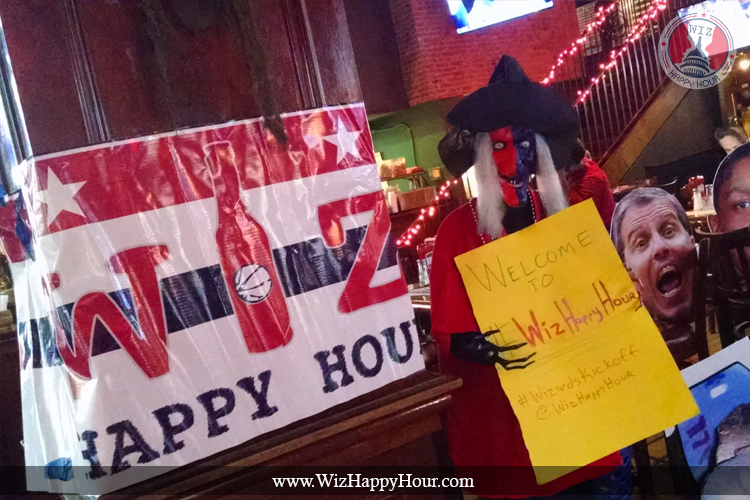 The Return Of Wiz Happy Hour & A Wizards Victory! A loud eruption bellowed out from the crowd. A guy in a John Wall jersey was high fiving a guy in a Bradley Beal shirsey. John Wall had just hit the eventual game winning floater with 12 seconds left and Wizards fans at Mister Days in Arlington were pumped up (view all the event photos here). After a very nerve-wracking closing seconds with some bizarre illegal touching call, fans sighed in relief and toasted to the victory while they caught their breaths. The Wizards won their first game, the first time that has happened in years, and we got to watch the whole thing with some amazing Wizards die hard fans. Mister Days was excited to have the Wiz Happy Hour crew in the house and the setup was more than perfect. Despite competing with a Caps/Penguins rivalry game and the World Series, the bar had the Wiz up on their biggest screen and the sweet sounds of Steve Buckhantz & Phil Chenier were broadcasting live and loud throughout the entire restaurant. That is the only way Wiz Happy Hour rolls. 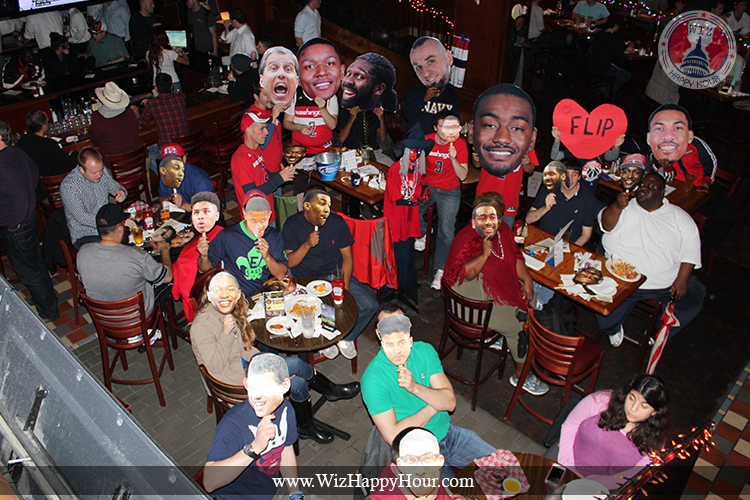 If you haven't watched a Wizards game at a viewing party you have to come out sometime. There is nothing better than watching a Wiz game with other fans, clapping at all the good plays, yelling at Nene on the bad plays. And the high fives, my gosh the high fives! The highlight of my night, and seemingly not everyone else's, was when Kris Humphries knocked down his first 3 pointer since 2004! I ordered a round of shots and celebrated like the Wizards won the finals. Not really, but, sort of. The event was a blast and it is only the start! We have 2 more parties this week. We'll be at the Greene Turtle in Fairfax on Friday (info) and at Penn Commons before & after the home opener on Saturday (info). As usual we'll have all our wacky bits and a few autographed prizes to give away.